My handcrafted, Ecoprinted book. Not only did I glue all the cover papers/fabrics, hand fold every sheet and hand stitch every signature of all the books you see in my shop BUT I made all the fabrics and papers you see on the covers and within some of the books! Handmade books and journals are a labor of love! Perfect for any journal use or a place to keep your most treasured secrets and memories. You can use this unique, one of a kind book for so many things! - Covers vary and are created with my hand crafted papers and/or silk fabrics. I recycle the leftover fabric from the silk garments that I make or the paper I make from from my ecoprinting to create covers that NO One else has! I have either hand painted or ecoprinted the silk fabric. They are sealed to help protect them from dirt and wear and tear. Eco printing involves collecting, then processing Nature's leaves, plants, fruit and flowers to create the actual colors, designs and textured look of the plants on fiber or paper. The colors are the ACTUAL colors the plants release to me! Totally sustainable, renewable and organic art form. - For this journal: I recycled silk noil from a garment I created. The gorgeous red color comes from the dried cochineal bug. I used this Ecoprinted silk noil fabric for the front, spine and back cover designs. Then attached the fabric to acid free chipboard. The design is from the actual plants that I used in the process with that amazing red color! The gorgeous colors you see in this book are Nature's actual colors. A unique and unusual gift that cannot be found in any store! Colors can vary depending on your computer and your monitor may not pick up the soft shades and subtle prints in my ecoprinted silks. Everything hand bound and handmade! With that comes the charming non-precision of papers being hand folded and used in a small North Carolina studio located in the rural Piedmont section of the state. Each of my silk pieces and paintings are unique. 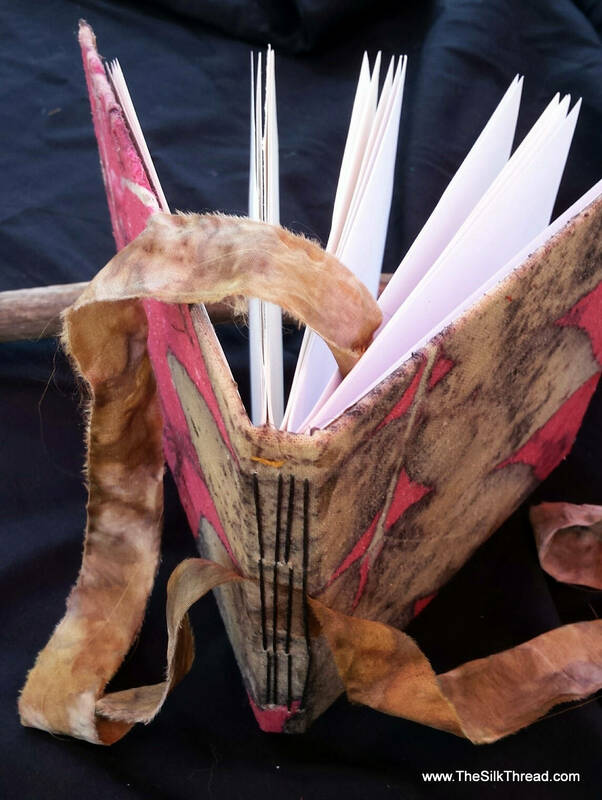 Handmade books and journals are a true labor of love!